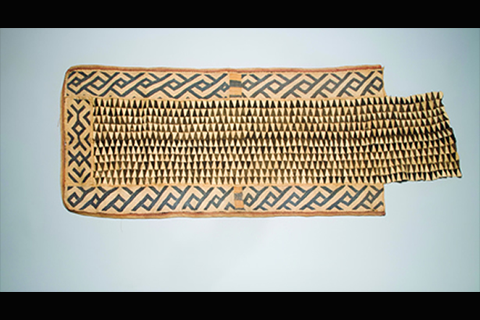 bark cloth, raffia and dye, 38 x 74 in. African artists producing “traditional” works strive to balance community values with individual success. Art in Real Life: Traditional African Art from the Lowe Art Museum explores the inherent tensions of this reality, which is necessarily impacted by pressures from a broad range of sectors, including the technological, geo-political, ecological, and economic. This exhibition, which is drawn from the Lowe Art Museum’s remarkable permanent collection, illustrates the continuing creativity and inventiveness of African artists in the face of an increasingly complex world. Traditional African art is an elastic genre: It is not restricted to ritual concerns or the day-to-day needs of rural villages. Rather it reflects any number of phenomena, including cultural and religious diversity, urbanization, economic change, tourism, and globalization. Art in contemporary Africa embraces a multitude of expressive modalities and techniques from activities geared toward the tourist market (including modified versions of ancestral dances performed for foreign visitors and art created specifically for export) to billboards, shop signs, and even graffiti intended for domestic use and consumption. Indeed, if you were to visit the African Continent today, you would find family heirlooms and generational treasures as well as the latest “hot” commodities from overseas. The range of materials employed in cultural production is equally vast: wood, textiles, pottery, cast brass, cutout sheet metal, repurposed rubber and linoleum (to name only the most common); all are routinely used in the service of creative expression in today’s Africa. As traditional African art has grown in popularity among collectors and connoisseurs around the world, the names of individual artists have become increasingly well known and their works more frequently admitted into the Western world’s conception of “Art.” Yet these same artists (who are intensely practical and understand the importance of creating works with market appeal) continue to make work that remains intimately connected to the vibrant tradition of art objects created specifically for ritual and ceremonial use. Their creations embody an inherent desire to express oneself while also addressing more prosaic needs, such as supporting one’s family. It is these works, and the creative processes and traditions associated with them, that are the subject of Art in Real Life. The opening reception for Transformative Visions and Art in Real Life and the Transformative Visions Artist Dialogue was generously underwritten by HSBC. Additional support for the Transformative Visions Artist Dialogue was provided by University of Miami’s Center for Humanities and the College of Arts and Sciences’ Strategic Initiatives Unit, the College’s Programs in Africana Studies and American Studies; the Departments of Anthropology, Art and Art History, History, Caribbean Literary; Cultural Studies in the Department of English; and Modern Languages and Literatures Joseph Carter Memorial Fund. Additional support for the opening reception for Transformative Visions and Art in Real Life was provided by Bacardi. The Lowe Art Museum is located on the campus of the University of Miami at 1301 Stanford Drive, Coral Gables. Museum gallery and store hours are Tuesday-Saturday 10 a.m. – 4 p.m. and Sunday noon – 4 p.m. The Museum is closed on Mondays and University holidays. General Admission (not including programs) is $10, $5 for senior citizens and non-UM students, and free for Lowe members, UM students, faculty and staff, and children under 12. Admission is free on Donation Day, the first Tuesday of every month. Public Program Admission is generally $10 for non-members and free for Lowe members. For more information, call 305.284.3535, tweet us @loweartmuseum, follow us on facebook.com/loweartmuseum, or visit lowemuseum.org.